Series SPY Vegetable oil purifier system is specially for treating the new and old Vegetable oil, changing the oil color, removing the bad odor from Vegetable oil. 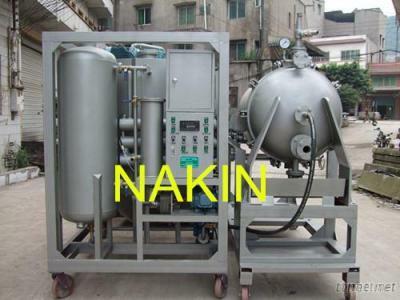 SPY Vegetable oil purifier uses physical adsorption and precision-filtering methods to inhibit acid value and peroxide value which is compliance with food processing safety law. SPY Vegetable oil purifier can effectively remove pigmentation and odor from used Vegetable oil, low down the oil acid value to extend the oil lifetime. This machine is good for the oil food frying factory and vegetable oil factory. 1. Equipment reasonable designed, easy to operate. 2. Physical adsorption and filtration technology, completely decolor and deodorization. 3. Stainless steel electric heater, low energy consumption, high efficiency and long lifetime. 4. Automatic oil control to ensure continuous safe operation of equipment. 5. Automatic closed filters, automatic slag, no filtering cloth, paper, low filtration costs.